S.O.S. is Book Three in the Acroname series. University professors, James and Stacy Sanders, find themselves caught up in the social networking world to such an extent that it affords them minimal time for themselves or their two children. 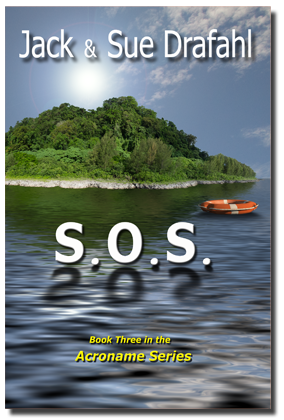 A catastrophic disaster throws these two together on an uninhabited extinct Pacific volcano, with little hope of being rescued. They quickly discover that teamwork and communicate are a priority, if they plan to survive. They must rely on their scuba diving skills, and their extensive knowledge in World War II history, to keep one step ahead of the of the forces of Mother Nature and a relentless cold-blooded killer. the latest technologies. Dennis has created a new device that quickly analyzes DNA samples at the molecular level, without damaging or even touching the samples. My daughter and I are avid Kindle readers. We share discovery of new writers when either of us by chance come across a really superior page-turner, "who dunit" detective story. 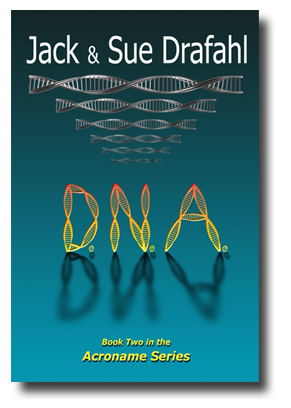 I just finished D.N.A., by Jack and Sue Drafahl. It kep me glued to my reading chair by the fire past midnight many nights. D.N.A. has all the varied elements that make a mystery novel compluslive reading. The authors' knowledge of police procedure, forensic technology and crimial law bears total credibiliity and never becomes tedious. Corruption, with billions of dollars at stake, at the level of the U.S. Senate and Military, touches depressingly on today's daily news. The murders - and there are many - follow a logical pattern and are artfully introduced without pathological, gory details that make the reader's stomach turn. The subplot, a warm and poignant love affair and warm family loyalty, provides relief from the malignant forces at work and is never tedious or graphically prurient. The daily advance in computer technology make the complex plot for the story excitingly believable. read them with his heart. A fugitive from prison, he desperately runs for his life, evading one attempt after another on his life. Curt lives up to his nickname of CAT and wonders if nine lives are enough? If you loved the TV action adventures of “The Fugitive” and “MacGyver,” then you will enjoy C. A. T.
This book is a great read - you won't want to put it down! 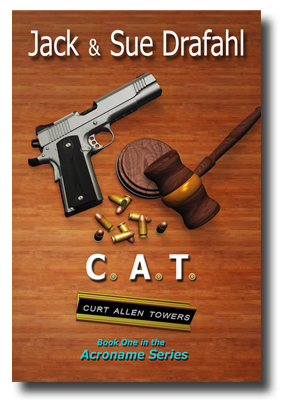 It's full of action, and will have you cheering for CAT (Curt Allen Towers) as he dodges the bad guys. The book has it all - there are twists and turns, suspense, action-packed moments, intrigue, humor and romance. It will keep you interested right to the end! I'm looking forward to their next book. Highly recommended! - Paul S.
It is a wonderful tale of intrigue, suspense, and adventure full of twists and turns. You can't help but admire and cheer for Curt along the way... An action-packed, enjoyable, and fun read will have you wanting more from the authors. It is sure to keep you entertained!. - Marsha P.
Fantastic Read! I loved this book-couldn’t put it down. I can't wait for their next book in this series ! - Pam M.
You can preview sample chapters by going to: C.A.T. You can also see a book trailer on C.A.T.